The Bregenzerwald Forest occupies a region in the western province of Vorarlberg and is well known for its natural and cultural importance. It reaches from the river Bregenzer Ache to the Bodensee or Lake Constance and is considered to be among the most scenic forstes of the Austrian Alps - given that an impressive 46 percent of Austria′s total surface is covered with forests, this means quite something. In terms of tourism infrastructure, the forest is by far not as remote as you imagine upon hearing "Alpine forest". In fact, the Bregenzerwald makes an easily accessible destination that proved to be popular both with domestic and foreign visitors. Many of the mountains in the region can be accessed with lifts - useful for skiing tourists in the winter and hikers during the summer season. In order to support tourism even further, the local tourism council issues the "Bregenzerwald Card" - it allows its holder to use public transportation within the Bregenzerwald free of charge; entrance fees for some minor attractions are included, too. 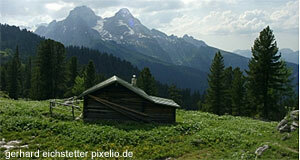 Visitors that stay for three nights or longer get the Bregenzerwald Card for free. Food aficionados like myself know the Bregenzerwald for the sake of the "Käsestraße" or "Road of Cheese". This somewhat cheesy name refers to a collaboration of local farmers, pub landlords, chefs and craftsmen whose work is concerned with regional cheeses. This includes in particular the "Bregenzerwälder Bergkäse", a cheese well-known even beyond Vorarlberg. Another key-attraction of the Bregenzerwald is the local narrow-gauge railway "Bregenzerwaldbahn". Colloquially, it is known as "′s Waldbähnle" ("Lil′ Forest Railway") and maintained for purely touristy reasons. Historically, it linked Bezau in the Bregenzerwald with the province′s capital Bregenz from 1902 to 1983. Today, only a small fraction of the original route is preserved: Approximately five kilometres of rails allow some steam to be produced and some scenic rivers and creeks to be seen from within the wagons - but that′s pretty much it. Enough to give you an idea of the remoteness of the Bregenzerwald Forest. The dialect of the people that live her is actually quite unusual - in a province full of unusual dialects. Most of it is influenced by the nearby German "Allgäu", although the dialects spoken in the forest are very distinct and at least people from Vorarlberg can immediately recognize it. Since I am from Salzburg with its Bavarian accent, I simply don′t understand folks from Vorarlberg, regardless of whether they are from the Bregenzerwald or from anywhere else. Attractions in the Bregenzerwald include - apart from those mentioned above - the town Bezau, which is the most important settlement within the forest. The village of Schwarzenberg is considered to be the quintessential Bregenzerwald Forest village and quite popular with international visitors. Attractions nearby include - surprise - Bregenz; the town of Dornbirn; the scenic town of Hohenems; and the further-away places in the south of Vorarlberg, such as Feldkirch or the skiing towns of the Arlberg region: Lech, Zürs, Stuben, St. Christoph, St. Anton and Pettneu.